Castle Farm is a self-catering luxury holiday cottage and sits in the heart of the Black Mountains in South Wales. It's a spacious family holiday home and country-retreat situated in an absolutely stunning and private location, providing outstanding views and sumptuous accommodation. Whether it is a dinner party, large family reunion, a team building event, a weekend in the country or to simply escape from the city, this is the perfect venue. 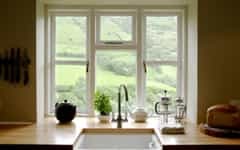 The 40-acre farm stands in an exceptionally private location, with direct access to the Brecon Beacons National Park behind the house, its own stretch of river for paddling in, a nature walk and acres of woods. Castle Farm consists of a lovely old farmhouse sleeping 10, a separate cottage for up to 7 and a studio style barn which has bunk beds for ten plus. The large farmhouse and cottage are available for rent either individually or together, by the week, weekend or mid week break. This is a fabulous place for lovers of the great outdoors, with superb hill walking outside the door. Barbecues are actively encouraged, either next to the river or closer to the house. There's also a riding outfit round the corner for anyone who wants to go trekking. Foodies will be in heaven, pottering around the famous market at Abergavenny and trying restaurants such as The Walnut Tree and The Hardwick. For the more literary, Hay-on-Wye is seven miles away. Within walking distance from Brecon National Park, our Brecon Beacons holiday accommodation is the perfect place to relax and unwind, take a few days off or a long-weekend and experience the abundance of nature and treat yourself to a digital detox. Use our holiday rental booking form to reserve your next break. We offer weekend getaways as well as mid-week breaks. You can rent the whole farm or either of our other two houses. Castle Farm is the perfect location for large parties or groups looking to book a week away in mid wales. Our accommodation is both family-friendly and pet-friendly. There are plenty of leisurely walks in the nearby vicinity and you will get maximum enjoyment from the extravagance of our location. 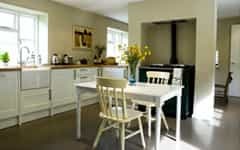 Castle Farm is self-catering, but catering can easily be arranged. 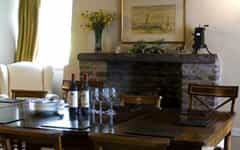 The dining room in the farmhouse has a 12-seat Georgian table, which can be extended to seat 16, while the light and airy kitchen has an Aga, a Butler sink, a 10 seat oak table and plenty of wooden workspace. The farmhouse, cottage and the barn all have SKY Freeview TV, DVD player, Hi-Fi, a growing supply of books and all the usual utilities (washing machine, tumble dryer, dishwasher etc). Recent vistors have said: "Its was like waking up in Nania", "Castle Farm was fantastic!! What a fabulous place! ", "We all had an absolutely brilliant weekend, the weather was incredible and the views from the property were no less so! ", "The location is just perfect", "It really felt like a home from home", "...a beautiful setting... very peaceful and just what was required! ", "What a beautiful home you have there. None of us wanted to leave"